If you’re a fan of Dropbox or Box, we know how frustrating it can be to attach files from those services into Gmail. With Mixmax, you can insert files from Dropbox and Box, and of course, Google Drive. This means you can share files from your favorite services, no matter where they are stored. To attach a file, hover over the paperclip icon in the bottom toolbar of your compose window. You’ll see a menu with options for Google Drive, Dropbox, Box, and your computer. Once you select an option, a window will appear where you can browse and select the file to insert into your message. After you select a file, your attachment will appear beautifully in your message. Install for free to try it out Dropbox, Box, and Google Drive integration right now. 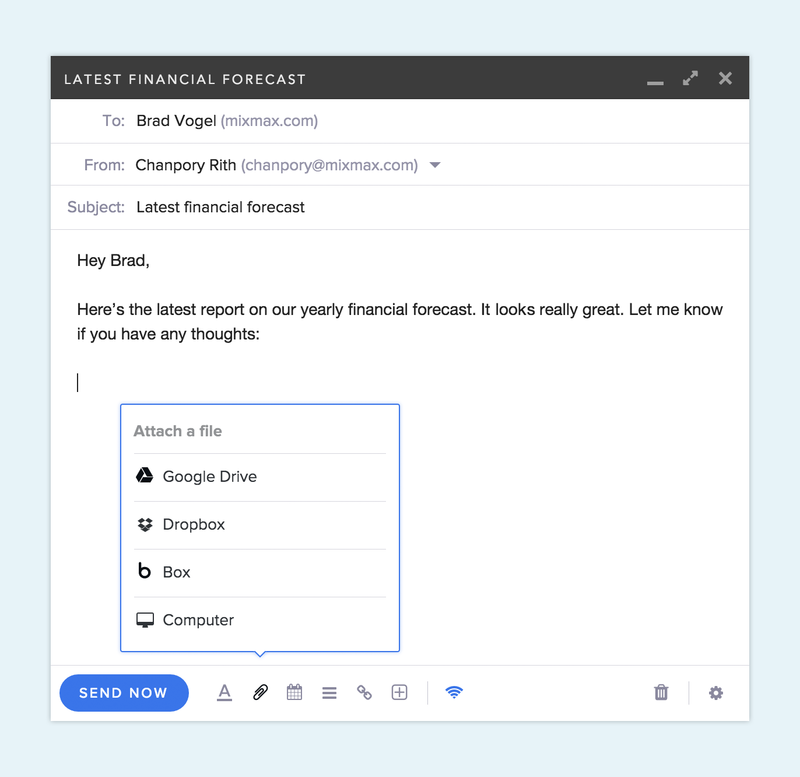 Better attachments is just one of the many ways Mixmax boosts your productivity with email. We’d love to hear your feedback. Reach out to us at hello@mixmax.com and follow us @Mixmax.